Pepsi asked us: Are You Fan Enough? 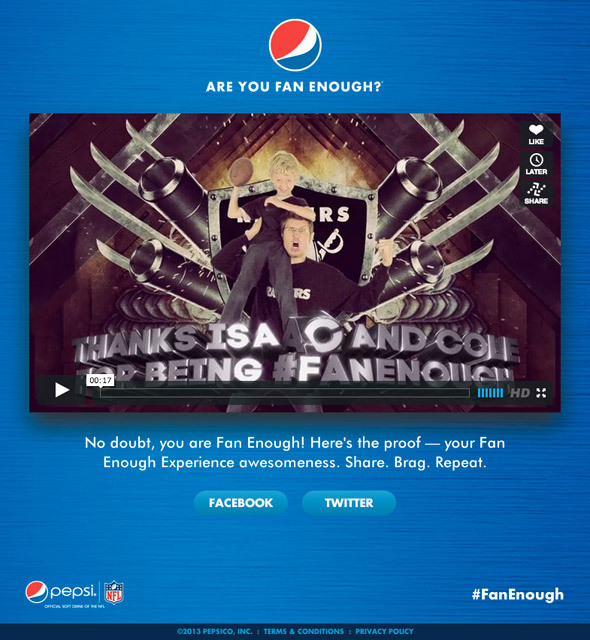 We worked with Mekanism and Pepsi / NFL to help football fans share their Are You Fan Enough? videos. Mekanism’s traveling production unit is visited stadium parking lots throughout the 2013 season to engage fans and shoot videos for them to share. Solarsilk helped architect the system used by the production staff to wrangle and post videos to the responsive Pepsi page we built. We also built Flash banners to drive traffic to Pepsi.com/NFL.